In the 10th Edition of Smile for the Camera, we’re asked to show our ancestors in costume. Not the Halloween type, but everyday wear. 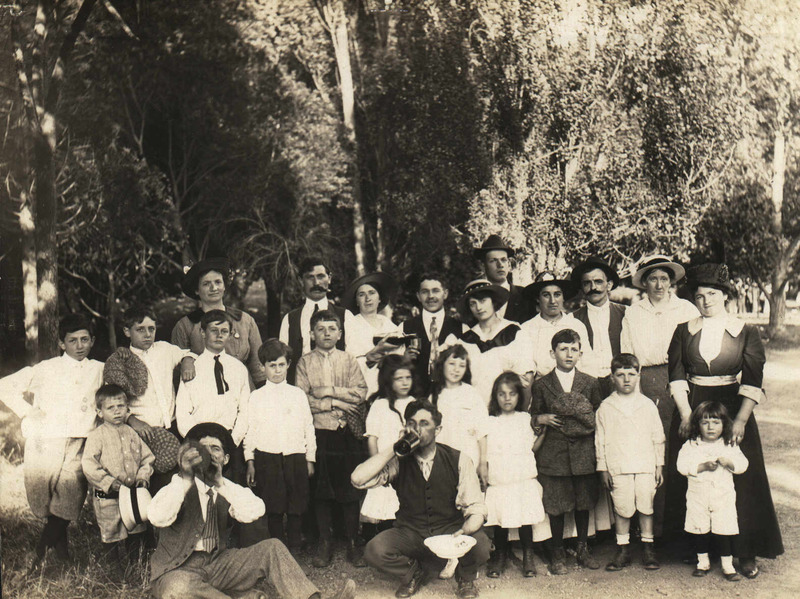 I’ve chosen a photograph of my Grandpa Lassalle out on a picnic with other members of the French community in the San Francisco Bay Area ca. 1912. Today if we were going on a picnic or to play outdoors, we’d be in jeans or shorts and t-shirts. Kids would wear there grubbies because sure enough their clothes would be ruined by the end of the day. Back in the early 1900s, it was different. People didn’t go out in public in their worst clothes. This was probably a Sunday, so the family set off for church first. Women were attired dresses and hats, men in suits and ties, young ladies with jauntily tied scarves, and children in their Sunday best. This photograph is one of two that survives from those early 1900 excursions. It was probably taken around 1912 given my Grandpa Lassalle’s age and the fact that Grandma is nowhere to be found. Everyone seems neatly pressed despite being in the great outdoors. Men are in ties, though most have thrown their jackets aside. The ladies look quite fashionable in their dresses and hats. The children all seem to be wearing white. I wonder what they looked like at the end of the day? My Grandpa is in the last row, fourth from the left. He’s wearing a dark vest and tie. If you look closely, the woman next to him is pretending to pour a bottle of wine into my Grandpa’s glass. I enjoy these kinds of photographs showing my ancestors at play. So many early photographs show them in a studio and looking very dour. Here I can see that they had some fun. I wonder if white was more practical than we think because it could be bleached by whatever the bleaching agent of the time (sun is great for that). I remember my mother who was born in 1921 saying that they were not allowed to run around on Sunday. It is a great photo. Do you know the names of all the people in it. Janet, thank you for you comment. You may be right. Unfortunately, my Grandfather is the only person I know in this photo. I know some must be friends and family as I have another photo from another picnic and some of the same people are in that photo too. What a treasure to have a photo like this, as you said, showing them having a little fun. It reminds me of pictures I have of my teenaged sons pretending to drink a bottle of beer. Of course, they did drink that bottle of beer when they got out of my sight! It must have been the practicality of white. Guess they could scrub and bleach that dirt right out. Whew! What work.